“29.88 SQ KM”, the title of Liliana Moro’s project, corresponds to the extension of the municipality of Trivero. It is divided into two parts. 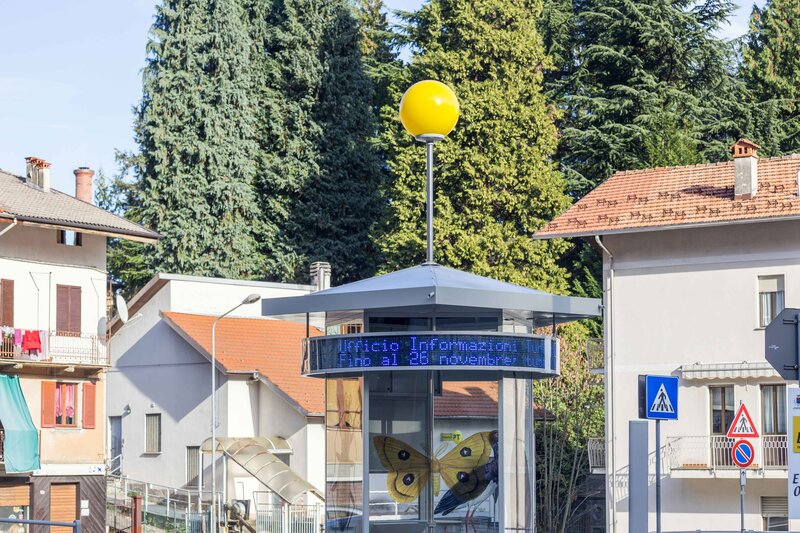 A new ‘infopoint’, located in the roundabout of Piazza della Repubblica, at the town entrance, greets all visitors. Moro defines it a ‘welcome facility’, created to spread news and maps, whose pentagonal shape intentionally calls to mind the newsstands of the past. Through the digital displays surrounding the base of the roof, it provides information about the weather conditions and the initiatives promoted by the City Council and the Oasi Zegna. Inside, it hosts a small workstation, functioning as a public help desk on the occasion of local initiatives. On the glass walls, stand out a series of blown-up images of animals that Moro appropriated from the Oasi’s wildlife guide, illustrated by Daniela Costa. After dark, these colourful figures transform the pavilion into a magic lantern, crowned with a bright yellow globe. A twin globe lights up on the façade of the nearby Pro Loco tourist office, at Centro Zegna, when it opens to the public. The artist has refurbished its premises in collaboration with the local association, and selected a group of old black and white photos from its archives. Inside, she installed a “talking” three-dimensional map, modelled after the altimetric diagram of Trivero. By pressing a button, the artist’s voice describes the artworks of ALL’APERTO - mimicking the old coin-operated audiophones - while a set of lights identifies their position. Each "guide" is associated with a characteristic sound, developed in collaboration with musician Tommaso Previdi.